On Friday I did my long-desired Snoqualmie Valley bus trip. I took the 554 to Issaquah, 208 to Snoqualmie, SVT (Snoqualmie Valley Transit) shuttle to Duvall, 224 to Redmond, and 545 back to Seattle. I wanted to see what’s there in rural east King County and which trails I might want to hike later. The SVT runs only weekdays so I had to take a day off work for it. I couldn’t decide whether to go to North Bend and backtrack to Snoqualmie, or to skip North Bend for another trip. 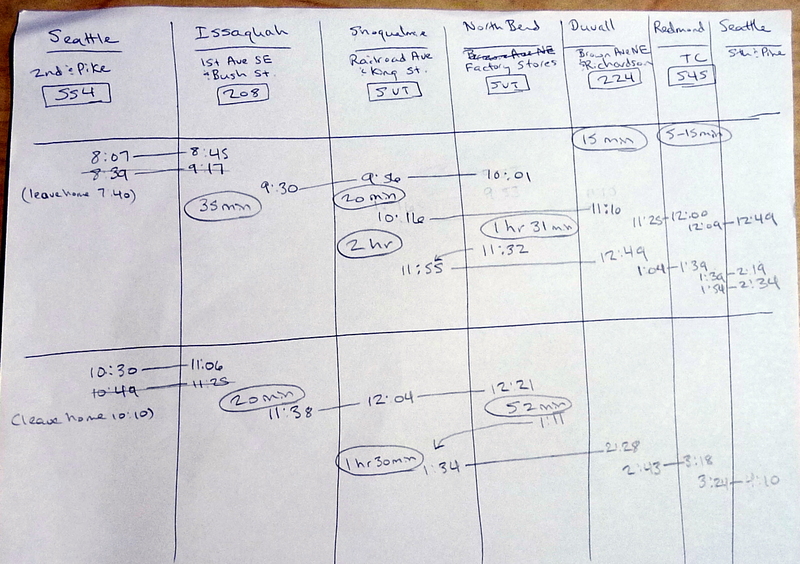 I made a table of possible schedules both with and without North Bend. It turned out there were only three choices: 8:07am-12:49pm (Snoqualmie only), 8:07am-2:19pm (same start time but later SVT), and 10:30am-4:10pm. I threw out a 6am trip as too early, and later trips would put me in Redmond after dark. I chose the earliest trip. At 8:07am I took the 554 from downtown Seattle and arrived at Issaquah City Hall around 8:45am. The 208 would come 35 minutes later and stop two blocks south. A railroad trail (Rainier Blvd) connects the bus stops and runs north-south through the city. The 208 stop was nicely visible, and next to it was a signboard of Issaquah trails. I followed the trail north a few blocks and found the old train station and telegraph office. A sign said passenger trains served Issaquah from 1885 to 1922, and freight rail until 1996. A supermarket is one block west of the 554 stop. The 208 went east at 9:30am. At the High Point freeway stop, one backpacker got off and I saw six cars parked at the intersection; there’s apparently a trail there. The bus continued to Snoqualmie Ridge, which is three exurban villages in a row. The bus goes through one of them, like the 168 through Timberlane. They all look New Urbanist correct, with a “Main Street” shopping district, no setbacks, row houses, and dozens of cookie-cutter Craftsman houses. I decided to skip North Bend so I got off at the main Snoqualmie stop, which is next to a railroad museum. Except there’s construction so the stop is closed. The SVT would come in 20 minutes, if it was running today. Otherwise the westbound 208 would come in 40 minutes. It was 9:56am and only one business was open, a cafe. I walked along the railroad museum veranda and looked in the windows. It was closed but the restrooms were open. I came back to the main road and saw a van turning a block away. I was afraid I’d missed the valley shuttle, and I wasn’t sure where it would stop with the construction, and the map is not very exact. So I walked toward the westbound 208 stop. The shuttle circled back and stopped at the Metro stop. I was a block away and waved to it and ran to it. It waited for me. SVT has two routes, the Valley Shuttle which goes from North Bend to Duvall approximately every 1 1/2 hours, and an unscheduled hourly circulator within North Bend and Snoqualmie. The fare is $1, or free if you’re transferring to/from Metro, but I put in $2 as a donation. I was the only passenger. I asked how many passengers normally ride, and he said an average of 8. The 208 comes east on Snoqualmie Parkway and turns south on Railroad Ave (the main street). If you turn north instead you get to Snoqualmie Falls, a 10-minute walk according to Google Maps. The shuttle stops there, but we went past it to Fall City, which has a roundabout, a river through the middle of town, and four people fishing. The bus waits for five minutes at the library. I don’t know if it always does that or it’s just ahead of schedule. Then it’s on to Carnation. Between the towns is farmland. At the south end of Carnation is Remlinger Farms, with a sign saying “1/2 mile east. Holiday pies. Farm restaurant. etc.” There’s not much to say about Carnation: some houses, that’s it. The shuttle turns up another highway to Duvall. This part of the shuttle route is trip is less interesting, a road through the woods. It’s a 2-lane highway without shoulders, which is kind of unsettling. Duvall is the largest town. It looks like “suburbia under construction”; i.e., pockets of suburbia. A Safeway plaza here, a strip mall there, but one block away are farms. This end of the shuttle route has a timed transfer to/from Metro. Normally it’d be a 15 minute wait but the shuttle was 10 minutes early. Around the bus stop is a supermarket/restaurant/retail plaza. A block downhill is a grand entrance to the Snoqualmie Valley trail and river, another unused train depot, restrooms, a park. and the Duvall police station. The 224 came at 11:25, and went on two more scary narrow 2-lane highways of nothingness. Then it turned onto Novelty Hill Road, with semi-rural 50-year-old houses, and then into Redmond Ridge. Redmond Ridge is another exurban village, much larger than the others I’d seen. It has a sixish-story senior housing complex, Main Street without setbacks, scores of row houses and cookie-cutter Craftsmans (Craftsmen? ), three (count ’em, three) roundabouts, etc. Two people get on in western Redmond Ridge, and the bus turns back onto Novelty Hill Road, which again has 50-year-old houses as if the clock has turned back. Then it’s Bear Creek, the exurban shopping center, and downtown Redmond. I have only nine minutes until the 545 comes so I don’t walk two blocks west to the downtown park and Sammamish River trail which I’d seen before. The 545 comes at 12:09pm and I take it to Seattle. I get off at the Montlake freeway station, and take the 43 home. The total trip time is 4 1/2 hours. It would have taken an hour or two longer if I’d chosen the later options, but on the other hand I’d have more time to go to Snoqualmie Falls or North Bend. The cost was within my $2.50 monthly pass (except the SVT donation). Without the pass it probably would have been $7 ORCA or $11.50 cash. Passenger counts on the buses: 10 people on the 554. 8 people on the 204 (one deboarding at High Point). 1 person (me) on the SVT. 3 people on the 224 (2 boarded in western Redmond Ridge). 39 people on the 545 (many of them boarding at Overlake TC or the 40th freeway stop). Of course, remember it was a semi-holiday, and the first segments were in the morning and in the reverse-commute direction. Thanks for doing this research, I much appreciate. Especially as one day I’d like to visit Snoqualmie Falls again via transit. As such, any advice how to use SVT (Snoqualmie Valley Transit) shuttle as a link? Thanks. Google Maps has some ideas, but I’d like your input. Do you mean how to get to Snoqualmie Falls by transit? Snoqualmie Parkway ends in a T with Railroad Avenue (Highway 202). The 208 goes east on Snoqualmie Parkway and turns south on Railroad Ave. You get off after the turn, cross the street to the northbound stop, and take the SVT to the Falls. Or you get off and take the trail on the west side of the highway; I saw people jogging on it. The highway crosses the river between the T and the Falls. Google Maps says the trail stops short of the bridge. I’m not sure if that’s true, but if it is I think you can walk easily enough on the highway although i wasn’t looking closely. (The scary shoulderless part of the highway is much further north.) Alternatively, you may be able to stay on the west side of the river and go from the trail’s end to the northern end of SE 69th Place. I don’t know if you can see the Falls from there or if you can walk across the dam. Thanks for the intel, exactly what I need. I walked it when I visited (due to the infrequent bus and I wanted to get into Snoqualmie to get lunch and ride the train at the museum) and while the shoulder is a bit narrow in spots it isn’t too bad. The bridge over the river has walkways on it. Several years ago I did the 554 -> 208 thing on a Saturday to get to Snoqualmie Falls and the railroad museum and tourist railroad. The 208 was actually fairly crowded. I think most of them were people headed to some factory outlet mall in North Bend. At that time one problem with the 208 was that it started out on Saturday mornings as once every two hours, so you had to plan the early morning part of the trip very carefully. The North Bend Premium Outlets, is where the 208 and SVT terminate. Previously it was called the North Bend Factory Stores, and many people still call it that. It’s west of the city center. I wouldn’t be surprised if workers take the bus to it, and there are charter buses for shoppers. But note that the 208 was rerouted a couple years ago. It (or rather the 209, and before that the 210) went through Fall City to Snoqualmie Falls and then to Snoqualmie and North Bend. Now it goes on Snoqualmie Parkway and bypasses Fall City and the Falls. The headways are between 2 and 2 1/2 hours apart. There is a large network of trails on Tiger Mountain accessible from the High Point stop. … and on the other side of I-90, there is a trail that connects to the Preston-Snoqualmie Trail.